On Sunday we began with a cartoon. And with me there is a chance that its either Calvin and Hobbes, or The Farside (which I spent more hours reading in high school than…well probably any other book). And Gary Larson has this great cartoon that looks like this. And here was my question for Sunday – how do we know God isn’t like this? Why is this funny? Why do we laugh – knowing its not like God has a smite button? How do we know that? Because for many years, many people had this view of God. That if you step out of line, smiting, cursing, or punishment is on its way. If you’re crops failed, its because of that sin. If you get sick, its punishment and God smiting you. So how do you know that God isn’t like this? Well the quick and easy, and true answer is this, because Jesus isn’t. If you’re God doesn’t look like Jesus, you have the wrong picture of God. And there isn’t any other way around this. 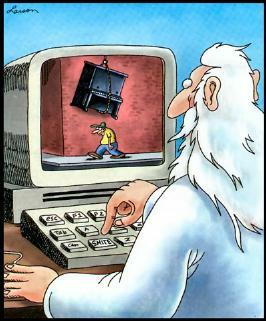 Gary Larson’s wrong, God isn’t like that, because Jesus isn’t like that. And yes this surely brings up tensions, there are difficult parts to reconcile then in the Bible. But the point is this: we cannot compromise on the revelation of God in Jesus Christ, no matter what else we do. We will need to use care in exegeting some of the Hebrew Bible in light of Jesus, but we cannot compromise the revelation of God in Jesus. With this understanding that Jesus reveals God, we got to know Jesu a bit better. We began by looking at the divinity of Jesus. The divinity of Jesus was actually something that was debated for a while in early Christianity. Yet there are some clear indications that Jesus is fully God, as we attest and believe, in Scripture. We looked at the sinlessness of Jesus, we looked at how he forgave sins (something only God can do), and how he accepts worship. But by far the biggest thing that testifies to his divinity, is how he was resurrected from the dead by God. God through resurrecting his son, validates all his claims about whom he is (Rom 1:14). We then looked at the humanity of Jesus. Now this is something that was clear to the early Christians, but that we struggle more with today. We like to think of Jesus as Superman. That he dresses up in humanity, like Clark Kent, but pulls out his superpowers to do miracles and so on. But this isn’t the picture the gospels paint – Jesus was fully human and Jesus is fully human. Jesus is the key for everything. He is the key for understanding God. He is also the key for understanding humanity and what it means to be human. Jesus is the key to everything. If you want to know God, if you want to know yourself – look to Jesus. So that was our challenge for Sunday – go home and read the gospels. Because the more you get to know him the clearer God becomes, and how to live life becomes clearer too. The foundation of our faith is Jesus Christ, first and foremost. The lens we interpret the Bible through is Jesus. Reasons for Divinity of Christ: Miracles, Forgives Sin, Sinless, Accepts Worship, and Was Resurrected. Jesus was and is human. Incarnation when Jesus enters the world isn’t for a moment, but for eternity. If you want to be certain about God, get close to Jesus. What stuck out to you from the sermon? What was challenging to you? How did God speak to you through it? What was new? Have you ever thought of God as Jesusy? Is there anything in your picture of God, that isn’t “Jesusy”? How does having Jesus as the perfect revelation, give clarity to who God is? Which do you find easier to believe in: the humanity or divinity of Jesus? Why is that? Which of the gospels are you going to read? Ask your kids what God is like. Ask them what other people think God is like. Then share with them the most important thing – what Jesus says God is like! Have them think about how Jesus reveals God. Ask them, what is Jesus like? And then tell them that’s what God is like. Challenge for the Week: Read the gospels. Nice article…I have my own blog on Faith at https://christchurchbelieve.wordpress.com. Take time to visit. I get inspired by blogs like this one.